Remember tether? That’s a cryptocurrency that calls itself a “stable coin.” A stable coin says that its value remains constant against some other type of currency. In theory, this offers the benefits of cryptocurrency usage (anonymity, easy transfer abroad, etc.) without the volatility that comes from speculation and panics (bitcoin fell 80% in a matter of weeks in early 2018). Tether was supposedly anchored to the dollar. Tether accomplished this by simply taking dollars from tether buyers and putting those in escrow accounts. When tether users wanted to convert back to dollars, they could simply deliver the tethers and receive dollars from the escrow at a set exchange rate. Or so they said. From the start, tether has been plagued by rumors that they did not keep all of the proceeds in dollars. Some forensic specialists estimated that dollars paid for tether were converted to bitcoin and used to prop up bitcoin and other crypto markets. 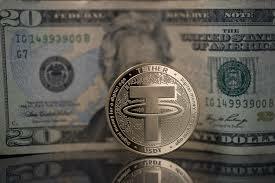 The actual powers behind tether have been mysterious and many suspect that they are miners or others who had a vested interest in propping up bitcoin and that the escrow dollars are long gone as the price of bitcoin imploded. Now, according to this article, tether has admitted that it does not back all of its coins with dollars. In fact, many of the dollars have been diverted to loans to affiliates. The ability of those affiliates to repay the loans is not clear. The use of the loan proceeds is also not clear. Tether has produced some statements showing that dollar reserves are sufficient. However, those statements are not from major banks and have not been audited. It’s also not clear if the “dollar reserves” are liquid dollars or just dollar-denominated notes of dubious creditworthiness. Perhaps all is well at tether, but there is substantial room for doubt. The cryptocurrency market has been swamped with frauds, thefts and mysterious coin disappearances. The best approach is to avoid the market entirely except for a very small handful of coins that do have valid use cases and protective governance. Tether is not on that list.